After photographing a juvenile snowy owl on Plum Island under overcast conditions, I returned a few days later to try my luck at photographing the bird in the golden light of sunset. I parked my car at Beach #7 and walked down around the tip of Plum Island to Sandy Point State Reservation to try to locate the owl again. While I had a very pleasant walk in the winter air, I came up empty in terms of spotting the owl, and I started walking back towards my car as the light started getting better and better. Resigned to having a trip with nothing photographic to show for it, I ascended the wooden stairs to the observation platform that is at the end of the trail to the parking lot. At the top I decided to scan the beach one last time for anything interesting in the pretty light. As I pivoted on the platform I noticed that this gorgeous merlin was watching me from less than 10 yards away. She seemed rather nonplussed about sharing the observation platform with me, and gave me the opportunity to snap off a few shots in both the vertical and horizontal orientations before she took to the air again. Unfortunately, I had already collapsed my tripod before ascending the stairs, so I had to shoot handheld during the encounter, and 500mm on a windy day did not make for many tack-sharp frames -- but this one came out well. View more raptors in my Birds of Prey Gallery. Fantastic capture of a most handsome raptor! Lovely lighting. Beautiful! The lighting and the tones are gorgeous. Hand held 500mm? You have a steady hand my friend. Wonderful. A great story Pat and a perfectly rendered picture to enjoy with it. That light is prime and the composition masterful. Beautiful bird and great photo with perfect lighting. It's a fantastic capture Pat..
Pat.This is a beautiful shot captured in the lovely golden light. Despite lack of tripod you have captured the moment perfectly. Gorgeous lighting and capture of the Merlin! Well taken, a very sharp image considering the conditions! What a beauty she is and she certainly did not appreciate your presence by the way she is looking at you. Hand held? Wow! Great picture. How serendipitous! Great shot, Pat. Can't imagine how you do it handheld. You must be using a really fast shutter speed, and the light was just perfect. 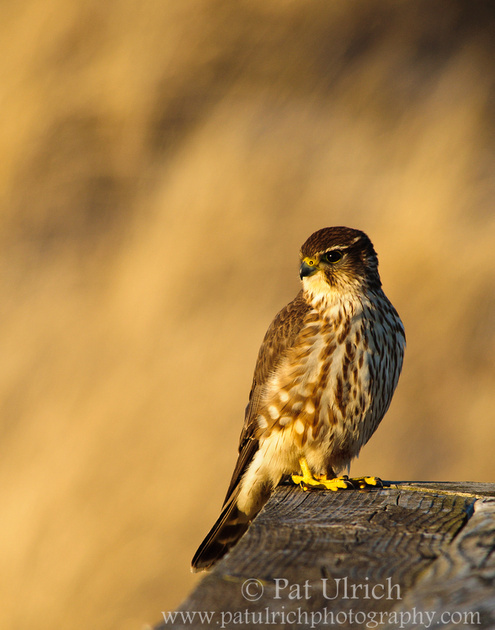 Merlins, such handsome birds and while I have always desired seeing one, it has not happened yet. This image captured is really splendid! I can't believe you got that close to a Merlin Pat! This is a truly exceptional shot of one of my favorite raptors, one that we rarely get to see, much less photograph. Tack sharp, beautiful bokeh, what else could be better? Brilliant!